Stalls and Spins in a Cessna 172. Posted on 29 May 17 by J.P.
I’ve never been a fan of doing stalls. One of my biggest struggles in preparing for my Private Pilot Checkride a few years ago was pulling a power-on stall in the Cherokee 140. The examiner commended me on my stalls when all was said and done, but I’ve never really practiced them that much. I figure my goal as a pilot was to not stall the airplane. When it came time to do my Biennial Flight Review, I again got fairly nervous doing the stalls, though I did them just fine. After my BFR I decided that I needed to get beyond this nervousness I had surrounding stalls. The club Cherokees are not rated for spin training, so I contacted another flight instructor I’d flown with in Greenville, S.C. at Flight School of Greenville. We set up a time to review stalls and agreed to do some spin training. After all, spinning an airplane from a stall was what I was nervous about, so I might as well do some spin training so I know what the airplane was going to do. The lesson went quite well. I found that I was actually focusing too much on the turn coordinator and “the ball” instead of paying attention to what the airplane was doing. I was beyond fixating on the ball, stalls actually became a piece of cake. Cyndy also introduced me to spins, with her demonstrating a spin to each side and then me spinning the airplane with her guidance. The biggest takeaway from the lesson is that I was entirely too rigid in the airplane. I needed to learn to sit back, relax and “become one with the airplane.” Once I relaxed, stopping fixating and paid more attention to the entire airplane, I felt much more at ease with these maneuvers. Here’s a video of the first three spins in the lesson. Posted on 20 May 17 by J.P. So I became a licensed Private Pilot in December 2014. At the time I had around 62 hours in my log book. My instructor insisted I was ready to be a Private Pilot and pushed me out of the nest. I flew with an examiner and passed my oral exam and checkride with relative ease. The examiner was complimentary of my aviation skills and gave me very constructive criticism. I’ve always been hesitant of doing stalls. I would break into a sweat when it was time to do stalls and this sentiment was echoed during my Biennial Flight Review this past December. I decided it was time to do something about it. So I scheduled some stall refresher and spin training with a different flight instructor in a different airplane in a different city. Today I flew with Cyndy from Flight School of Greenville in Greenville, S.C. Work occasionally brings me here to Greenville and I had flown with Cyndy a couple of times before. As a “Cherokee Driver”, the Cessna 172 always feels a little foreign to me but I felt very comfortable by the end of the lesson today. Cyndy and I went through the steps of slow flight, power off stalls, power off stalls in a bank, power on stalls (straight ahead and in a bank) and then we did a few spins. A few takeaways of some habits I have developed. 1. I grip the yoke and actually try too hard to keep the airplane under control. I don’t sit back and relax in the seat. I’m hunched forward in a little bit of a “panic” stance. Once I kicked back and relaxed I was much better. 2. I was focusing too much on the turn coordinator in slow flight and not paying enough attention to the entire airplane. Cyndy had me do a lot of flying just using my feet. The forgiving nature of the Cherokee has made me a little lazy on the rudders. Dancing on the rudders today make me feel much more comfortable with the airplane and what it’s doing in the air. I’ve always been comfortable but I don’t always listen to the airplane. I made good strides to “becoming one with your airplane” today. 3. I had developed a bad habit of not keeping back pressure on the yoke after landing, placing too much weight on the front gear. This is something that I absolutely need to stop and another one of my focuses in the near term. I videotaped the flight and will be reviewing the video to review what I did and need to do and will be developing a checklist as part of my pre-flight before I even go to the airport. Getting out of your comfort zone and garnering a new perspective from someone is an excellent away to look for bad habits and replace them with good ones and it’s always a great learning experience. I highly recommend this approach for anyone that feels they are in an aviation rut. Today was a great day to fly! Flying Solo. Talking To Myself. Posted on 1 Apr 17 by J.P.
I’ve decided to get back into the blogging and making video game for my aviation activities. The ground comes at you fast when you pull the engine, that’s why you push the throttle back in. Life works the same way. I am recovering from recent surgery and last week I asked my doctor if it was good for me to start flying again. After being on the ground for a month, and interrupting my IFR training in the process, I really wanted to get in the air. I kinda like flying. I was originally going to go up with a fellow owner/pilot in the club who just got his commercial multi-engine rating to act as safety pilot. He had a last minute change of plans, so I went up solo. One of my personal minimums, at least at this stage of the game, is that if I haven’t flown in over a month, I go up with a safety pilot or solo to make sure I’m feeling good. I’m not worried that I don’t remember how to fly the airplane, I’m more concerned about making sure I’m not distracted by worrying about non-pilot passengers as well. So I went up for a solo flight in the general area, skirting around some very light “green stuff” on the Garmin 530W weather display and on Foreflight, data courtesy of our ADS-B receiver. The flight was very enjoyable and I was having fun just doing a little site seeing. Looking back at the video I realized how much I talk to myself, mostly in a very humorous way, when I’m flying solo. I edited the flight video down to all these comments. So here I am, talking to myself, having fun and sounding a little foolish at 3000 feet. Posted on 7 Oct 16 by J.P.
It’s been over a year since I’ve tended to this blog. My intention is to get back to posting here, as I have started my instrument training again and it’s turning out to be a better experience than I thought it would be. I look forward to writing about my lesson adventures here. 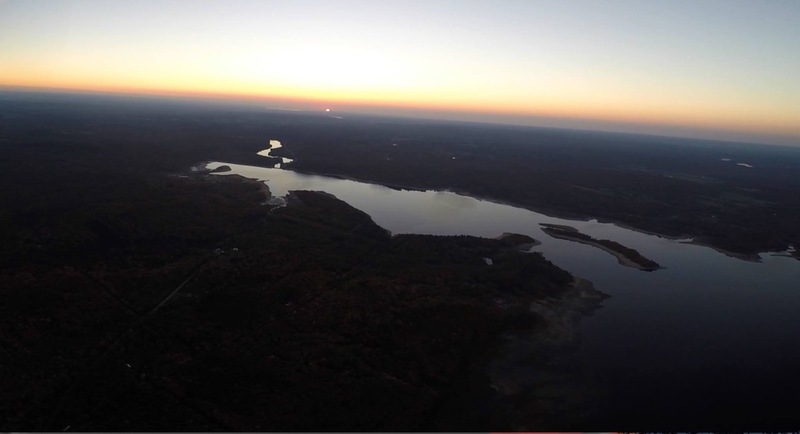 In the meanwhile, I’ll share some photos from last night’s flight, when my husband and I went flying in the Cherokee 180 just to look at the changing leaves near the Southern Adirondacks and enjoy the sunset from the sky. I have a nifty new GoPro mount that I have been enjoying very much; I’ll share the details on that in the next blog post. In the meanwhile, enjoy the scenery. Posted on 1 Sep 15 by J.P. This is my first video with a two camera setup. I decided to keep the video simple, it’s our approach and landing at KRME on Runway 33 on Sunday 30 Aug. I wanted to play around with video effects, so here’s my first attempt at a two camera approach. Edited using the latest version of iMovie on a MacBook Pro 15-inch. Video: One Circuit In The Pattern. Posted on 26 Aug 15 by J.P.
Back in June I spent an hour practicing landings in the Cherokee 180. At the time I was gearing up for our flight to Oshkosh by working on spot landings and with various landing configurations. Here’s a short video of one of my circuits in the pattern. Posted on 25 Aug 15 by J.P.
As a kid I used to watch airplanes and airliners coming into KSYR from the backyard of my grandparents’ house and if I was lucky, from the parking lot of the Northern Lights Shopping Center. My dad was never interested in landing at KSYR, mostly because he didn’t have a radio in the Piper J5-A so we couldn’t enter Syracuse’s airspace, but I have always wanted to land there in a general aviation airplane. I’ve landed at KSYR a couple of times, as safety pilot with my friend Pat who was practicing instrument approaches to runway 28 and with my friend Chuck (who was my instructor before I had my PPL), who helped me do my instrument approach to 28. Sunday night the winds were favoring runway 10 at Syracuse, so I decided to fly Earl and I out there to do a touch ‘n go. 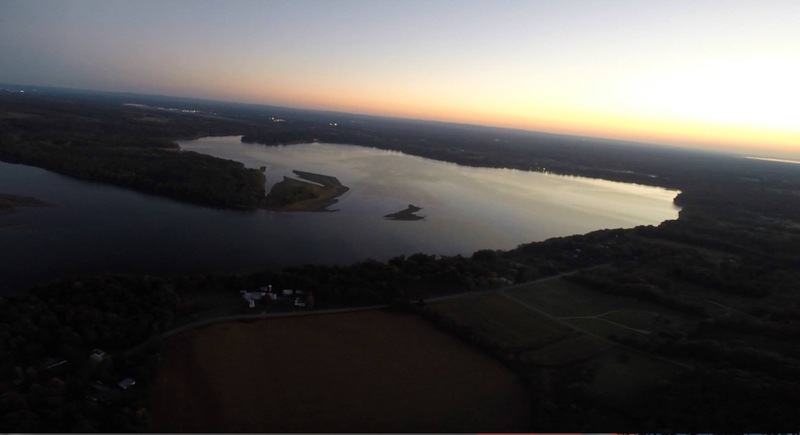 I then asked permission to fly over downtown before circling around Onondaga Lake and then heading home. My intent was to fly around the far side of both Onondaga and Oneida Lakes before heading to KRME, but traffic prevented me from doing this, but we still had a nice view of Downtown Syracuse. Here’s a video of my approach and landing at KSYR on runway 10. I wondered if there was a young future aviator watching from Northern Lights Shopping Center as we made our approach, just like I did so many years ago.